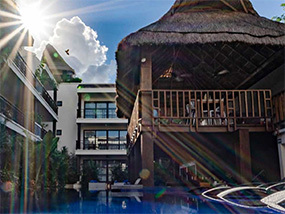 Enjoy a 4 night stay for 2 guests in a Penthouse Suite with private pool and terrace at the newly opened KASA Hotel Parota which sits in an uncrowded, newly designed area of stunning Tulum, Mexico, which is renowned for its pristine, uncrowded beaches, turquoise waters and outstanding restaurants. Stay includes: welcome cocktails; daily a la Carte Bubbling Breakfast (which includes mimosas) for 2 people; complimentary wifi in room & all hotel areas; complimentary in room coffee; complimentary use of bicycles and complimentary Shuttle Service roundtrip to the partner oceanfront Beach Club “Mia Restaurant & Beach Club”. Stay is valued at approximately £1,200 GBP / $1,585 USD*. Please note all additional purchases including further meals, drinks, spa treatments, excursions etc. must be paid for by the winner separately. Auction stay dates: to be booked in advance and taken before 26 March 2020, excluding stays over Christmas & New Year’s (20 December 2019 to 04 January 2020) and Thanksgiving (22 to 30 November 2019), subject to availability. The newly opened KASA Hotel Parota is a luxury boutique hotel, and a member of Small Luxury Hotels of the World, located in Tulum, Mexico. Tulum is well renowned for its pristine, uncrowded beaches, turquoise waters and outstanding restaurants. This tropically-designed hotel lies a few minutes away from the Tulum Mayan ruins, the Sian Ka’an Biosphere and only 2 hours from the world famous ruins of Chichén Itzá. Lying inside the exclusive Aldea Zamá neighbourhood of Tulum, this Caribbean destination is a place where protected green areas maintain the region’s natural appeal and where strict aesthetic and construction guidelines promote a polished, tasteful ambiance and beautifully natural environment. The hotel boasts: an infinity pool with a swim-up bar and restaurant as well as sunbeds and loungers, wifi, airport transportation, daily maid service, private yoga instructor, in room massage and complimentary bicycles for exploring the nearby shops, restaurants, bars and beaches. Guests can also take the complimentary private shuttle to their partnered oceanfront Beach Club: “Mia Restaurant & Beach Club”, which lies less than 5 minutes away, and where guests can enjoy a great selection of fabulous food and drinks under the shade of the palm trees, or try one of the many beach activities available in the warm turquoise waters of the Caribbean sea. KASA Hotel Parota Tulum’s guest concierge can also arrange signature KASA Experiences, which include full and half-day adventure activities as well as healing spa treatments. This family-friendly hotel gives guests the feeling of a home away from home, with its casual yet professional approach to service, which feels more like you’re visiting a friend’s beach house than a luxury hotel. The hotel features comfortable, spacious guest rooms and room expansive suites with fully equipped kitchens and oversized balconies. The winner and their guest will be staying in a Penthouse Suite with private pool and terrace. The suite features a king size bed with high thread count linens and an oversized bathroom with rain shower and high-end finish. Amenities include: air conditioning, flat-screen TV, seating area, fully equipped open-concept kitchen and a spacious terrace with jungle views overlooking the pool, as well as a private rooftop terrace with a half bath, infinity-edge pool and shady palapa with plenty of seating and a dining area. Luxury Travel Diary terms and conditions apply. *This auction item is valued at approximately £1,200 GBP by KASA Hotel Parota, Tulum, Mexico – please note this valuation is the list price provided to Luxury Travel Diary by the Auction Prize Provider and should be used as a guide only as cheaper discounted rates may be available. No cash alternative is available and this auction item is non-refundable and non-transferable. This auction item excludes flights and transport – you will need to arrange your own flights / transportation to and from your home to KASA Hotel Parota, Tulum, Mexico to coincide with your booking. Your stay is subject to availability, must be booked in advance and taken before 26 March 2020, excluding stays over Christmas & New Year’s (20 December 2019 to 04 January 2020) and Thanksgiving (22 to 30 November 2019). Please note any associated taxes / resort fees / entrance fees etc. and all additional purchases will be collected from the winner by the relevant property at the time of booking your stay or on departure and will not be deducted from the amount bid for the item. The winner will receive a prize stay voucher from KASA Hotel Parota which may be redeemed only once for its full face value and must be presented for redemption upon arrival to the hotel. Photocopies will not be accepted, nor will any damaged or defaced Gift Certificates. In the event that the value of the Gift Certificate does not cover the full cost of the accommodation the balance must be paid by the auction winner to hotel in cash or by valid debit/credit card and the hotel requires a valid debit/credit card deposit for such costs when accepting a reservation or redeeming the Gift Certificate. Winners must pay for their auction item in full via PayPal within 48 hours of the auction end. The full Terms of our auctions can be found here. To the fullest extent permitted by law, Luxury Travel Diary will not be liable for any loss or damage arising out of the winners’ use or enjoyment of the prize; and the winner acknowledges that Luxury Travel Diary accepts no responsibility whether directly or indirectly for any claims whatsoever arising in respect of the prizes provided by third party providers or sponsors.